We recommend your 1st lesson be at 4 months old, then a 2nd lesson at 5 months old. These lessons are essential to get him moving along on his training, they also help to lay a foundation for his Gun Introduction at 6 month old. We’ll show you how to work him on live birds and teach you things that you should be doing with your pup as well as things not to do with your pup. Like; to please refrain from from using “sit” & ”heal” with your pup until he is 6 months old. We would like you to bring out your pup, to show you how to work on quartering in the field, using their nose to find live birds, chasing out after fly away birds, work on recall and continue working on retrieve. 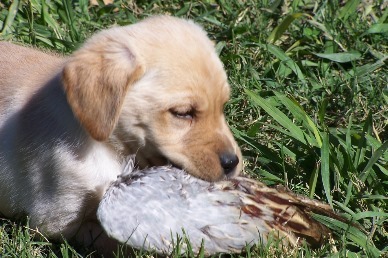 All of this puppy training gets these young dogs introduced to live birds at the correct time, without putting too much pressure on them as well as showing you how to keep your family pet under control without using too many commands. This is useful because most families are looking for a dual purposed dog! Bring your 6 to 7 month old pup in for his 'Introduction to the Gun'. 'Gun shyness' is a man-made problem and is nearly impossible to correct. Please don't take your dog to the Gun Range to get him accustomed to the gun! Also, do not dove hunt him in his first season. We recommend that you get some professional help with this aspect of the training so that it is done correctly! This is generally a 2 - 3 week program. 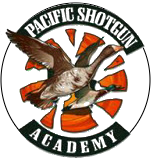 We'll get him chasing out on live birds each week having a good time and over the course of the week, shoot over him using a starter pistol, and a shotgun. He'll have a great time, and this will really build his enthusiasm! You can call to schedule your weekday lesson, they are offered Tuesday-Friday from 8am -12 noon or take advantage of our Saturday morning open house also from 8am -12 noon. All training and lessons are give at the Olive Hill Kennels. *If you have purchased an Olive Hill Kennel Pup these two lessons are required in order to receive your 2 weeks of free gun dog introduction at 6 months old.